I have several wonderful new picture books to add to my list of Picture Books with an Australian Theme. You can find the updated list embedded far below. Drought is a children’s picture book written by Jackie French, illustrated by Bruce Whatley, and published by Scholastic Australia (2018.) RRP: $Au 24.99 HB. It joins Fire, Flood and Cyclone by French and Whatley in the Natural Disaster series. Drought spread its withered, deadly hand. I loved Cyclone so I expected Drought to be special. It is! There’s the front cover - gouged by cracked earth lines that kids can run fingertips along. Then there’s the rhyme - not the rollicking kind, but couplets that enhance the story with gentle echoes. The word pictures - carefully chosen to convey perspectives and scenes kids will remember and relate to. The illustrations - graphite pencil and acrylic wash one minute conveying scorched earth and dust, and at last scattered thunderstorms and weeping skies. The whole adding to our understanding of drought - our fear and dread, our bewilderment, our Australian acceptance. I hope you’ll appreciate Drought as much as I did. It seems to me this whole series is a must for any library. If you want your students to understand what it means to be Australian, then I believe grasping the physical extremes of our country and their effect on all of us is hugely important. This is a beautiful and important book. I’ll be adding Drought to both my List of Picture Books and Educational Activities on Australia, and Children’s Picture Books about Change. I Remember is a children’s picture book by Joanne Crawford and Kerry Anne Jordinson, published by Magabala Books (2018). RRP: $Au 17.99 PB. The story starts with an older woman remembering her youth, Specifically when her younger self went on family camping trips to the Murchison River. Crawford’s words and Jordinson’s images immerse us in all the joys of a family camping trip - setting up camp, fishing, playing in the water, cooking damper over the fire, falling asleep to a chorus of strange night time sounds. Most kids will be able to connect those experiences to similar ones of their own. We come back to the older lady who confesses her memories sometimes fade, but then celebrates those things she DOES remember. This would be a good choice for educators wanting resources about Families, and people who want kids to understand that memory lapses can be difficult for everyone, but happy memories are worth celebrating. My Australia is a children’s picture book by Julie Murphy, illustrated by Garry Fleming and published by NLA Publishing (2018). RRP: $Au 24.99 I have previously reviewed Murphy’s That’s Wild, and Fleming’s Pobblebonks. My Australia is a poetic journey across the Australian landscape. Celebrating both the ancient and modern Australia, the book invites readers to travel across the delights of our continent - from dry deserts to lush rainforests, from high mountains to stormy seashores, from winding rivers to fertile swamplands - all the magical places that are my Australia. With colourful illustrations by Garry Fleming (creator of Bollygum), Julie Murphy's story is beautifully simple, and sure to excite young readers, encouraging a greater awareness and appreciation of our precious and irreplaceable natural places. (The poem is followed by factual information about Australian natural environments, illustrated with stunning photographs). It’s easy to forget what truly amazing country Australia is! Such an ancient land, and with such diverse physical, botanical and zoological features. My Australia is a real celebration of this diversity. The partnership of Murphy and Fleming works very, very well. Murphy’s verse is spare, simple enough for kids to read, and yet focussing on the contrasts and highlights of different landscapes. We read of “wild wind-carved mountains” and “proud towers of glass”. Fleming brings Murphy’s words to visual life for us. His illustrations are originally painted on illustration board with watercolour and gouache. They are striking, detailed and incredibly evocative. I recommend this picture book as a stunning addition to schools who want Australian kids to gain more understanding of our varied natural environments, to libraries and it also make a great gift to send overseas. There are notes at the back of the book about some of Australia’s habitats, and teacher notes are available at NLA's website. Kookaburras Love to Laugh is a children’s picture book by Laura and Philip Bunting, published by Omnibus (2018.) RRP: $Au 16.99 HB. I have previously reviewed Mopoke, Koalas Eat Gum Leaves and a Bunting illustrated book, Excuse Me!. It is no laughing matter when you are the most serious bird in the borough. I love the Bunting Books, two of which made it to my List of Top Children’s Picture Books of 2017. Kookaburras Love to Laugh is a definite contender for 2018. You’ll find the same quirky humour and delightful illustrations in this as the Bunting’s previous books. Though at first glance very simple, with no fussy detail, yet I predict kids will return again and again to this book. Yes, it’s partly the pun and visual gags about bodily “wind” which will always appeal to the primary school set. But it’s also Australian humour that kids will relate to from their own lives - like the kookaburra and a seagull tussling over a chip, and the kookaburra demanding to be allowed to escape from inside a pelican by stating, “…peli can’t”. I know kids will love the way Bunting depicts a range of Australian (and plastic imported) birds as much as I did. If you’re looking for a special gift for a child, grab Kookaburras Love to Laugh. If you need a great story to read aloud and have kids rolling in the aisles, grab Kookaburras Love to Laugh. If you just want kids to have access to the most delightful and entertaining books ever, definitely add it to your list. It’s another Bunting triumph! Bird to Bird is a children’s picture book by Claire Saxby and Wayne Harris, published by Walker Books (2018.) RRP: $Au 24.99 Previously I have reviewed Saxby’s There Was an Old Sailor, Sheep, Goat and the Creaking Gate, Wild Pa and Koala. A bird drops a seed to the floor of the forest. The seed grows into a sapling, then a tree. The tree is felled and taken to a busy city. Bird to Bird is the story of one bird, one seed, one tree. Award-winning picture book creators Claire Saxby and Wayne Harris have crafted a gentle story of nature, history, recycling and art. As we have come to expect in Saxby’s books, the text is lyrical and creates beautiful word pictures. It’s also satisfying as it helps us understand the cycle of nature and mankind. Harris’s illustrations are atmospheric, helping bring the history of a simple piece of wood to life. Bird to Bird is an excellent choice for a resource box about nature or sustainability, and enhances children’s studies about early Australian history. It’s going on my List of Children’s Picture Books about the Environment. Somewhere in the Reef is a children’s picture book by Marcello Pennacchio, illustrated by Danny Snell, and published by Scholastic Australia (2018.) RRP: $Au 24.99 HB. lived a mother dolphin and her little calf one. as they leapt out of the water and had fun in the sun. Pennacchio has taken the framework of the children’s rhyme Over in the Meadow and piggybacked on it come up with a new rhyming text that takes us on a tour of the amazingly diverse Great Barrier Reef. We meet various inhabitants in their specific settings. Despite the limited text, Pennacchio’s vocabulary isn’t dumbed down and we encounter scientific terms like “archipelago”, “fry”, “anemone” and “murky brine”. I found it a little tricky to read aloud and decided to discuss the pictures instead on some pages. Kids will be attracted to the colourful cover and the realistic but cartoonish underwater animals. I’m not sure how Snell achieves both realism AND cartoon-style, yet that’s what it seems to me and I suspect it’s a style that will appeal to many kids. There’s a hint of expression on the animal’s faces and I’m sure I can see a kindly glint in mother turtle’s eyes. Somewhere in the Reef is a contender for school and public libraries. It’s going on my List of Children’s Picture Books about the Environment. 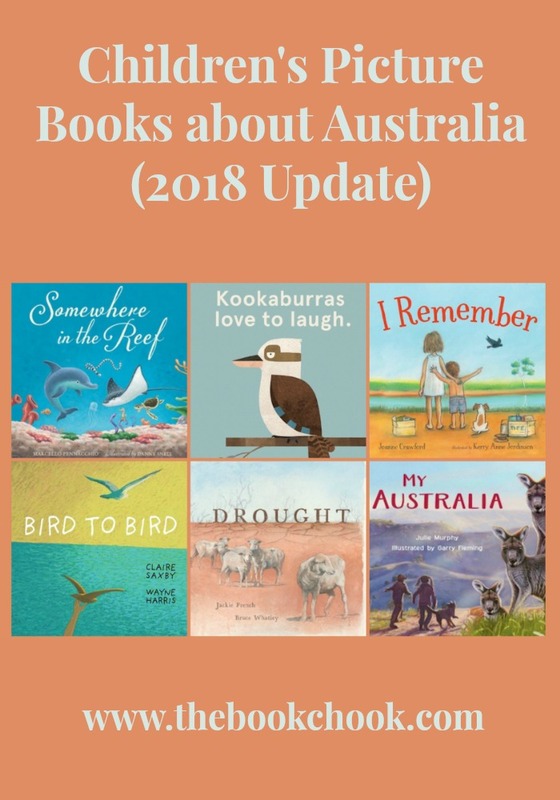 All of these books will be added to my existing List, Picture Books and Educational Activities on Australia, embedded below. Be sure to use the bottom arrow to navigate to the second page!